Put all the ingredients except oil in a big mixing bowl. Add small quantities of water to make a smooth batter, so that there are no lumps in it. Set aside for 10 minutes. Heat a non-stick griddle on medium heat and grease it with oil. 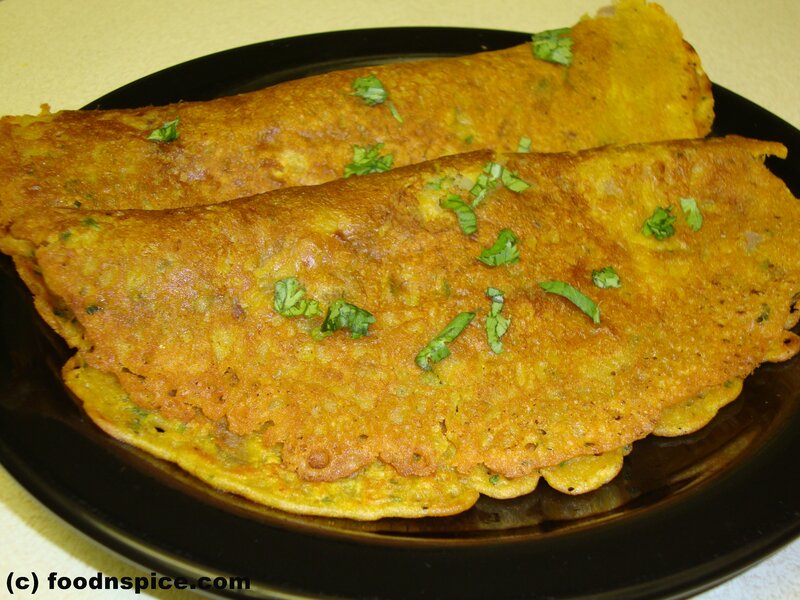 Pour a laddle of batter in the middle of the pan and spread it evenly like an omelette (or a crepe or dosa). Pour 1 tsp of oil around the corners of the pancake and cover it with a lid for a minute. Press the pancake lightly with a spatula all around so that it cooks evenly and turns golden brown and crispy. Serve the pancakes hot with ketchup or chutney.